Barbara A. Mangi is no stranger to adversity, pain, and loss in her life. But nothing had even remotely prepared her for the murder of her twenty-five-year-old daughter in August 2007. Barbara shares the story of her flawed, human journey as she not only fights to heal herself, but also struggles to keep her marriage together. 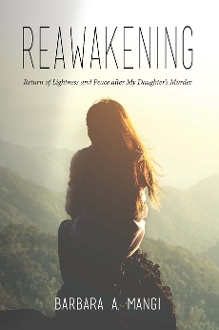 In the early days and months after the murder, she was simply surviving one day at a time, digging deep to tap into the strength she had developed throughout her previous life experiences. As she journeyed along her own unique healing path over the next several years, she defined all the steps she needed to heal herself in a healthy way. Little by little, she discovered she was less often finding herself in the depths of despair and more often finding joy and happiness in living life once again. If this could happen to her, then hopefully she could make a difference by helping others who may have experienced a tragedy or are going through a difficult time in their life. Here she shares the life-giving lessons she learned along the way, hopeful that the reader may discover his or her own path to finding lightness and peace once again.